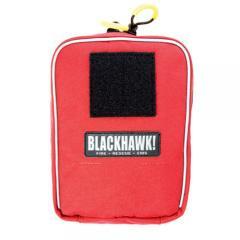 The Fire/EMS Mini Medical Pouch is a convenient and secure way to carry smaller pieces of emergency response equipment. Its hybrid design allows it to attach to a duty belt attachment, ALICE clip or S.T.R.I.K.E. platform, making it compatible with a wide range of equipment and allowing easy combination with other equipment pouches for a more extensive storage solution. It is made from tough 1000 denier nylon in bright red, and includes a hook-and-loop panel for attaching a red cross patch or other ID. Reflective gray piping and zipper pull cording makes it easy to find in low-light conditions.